IRBIL, IRAQ (ASSOCIATED PRESS) -- The Latest on developments in Iraq (all times local): 6:00 p.m. A central government imposed ban on international flights servicing airports in Iraq's Kurdish region has gone into effect Friday evening at 6:00 p.m. local. The flight ban has so far been the most significant escalation amid heightened tensions — largely marked by threats from Baghdad and neighboring countries — following the controversial referendum on support for independence held by Iraq's Kurds Monday. While Iraq's parliament has called for troops to retake the contested city of Kirkuk from Kurdish forces and Turkey has threatened military intervention, Iraqi Prime Minister Haider al-Abadi has not authorized the use of force against the Kurdish region. Al-Abadi first warned of the flight ban the day after the referendum was held, demanding the Kurdish region hand their airports over to the central government. 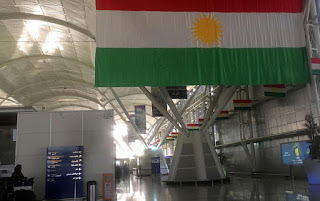 While Baghdad controls the airspace over the Kurdish region, immigration and security inside the airports themselves are controlled by local Kurdish region officials and security forces. Iraqi Prime Minister Haider al-Abadi says the flight ban set to go into effect this evening is not intended to "starve" the Kurdish people. Al-Abadi says "central government control of air and land ports in the Kurdistan region is not meant to starve, besiege and prevent (the delivery of) supplies to the citizens in the region as alleged by some Kurdistan region officials," in a written statement released by his office Friday afternoon. All international flights traveling to and from the Kurdish region are expected to halt at 6:00 p.m. local time Friday. A prolonged flight ban has the potential to further restrict the Kurdish region's already struggling economy, however land border crossings — where the vast majority of trade passes — remain open. Talar Saleh, the general director of Irbil International Airport, says Kurdish authorities were unaware of how to comply with Baghdad's demand to hand the airport over to federal authorities before Friday evening in order to avert the threatened flight ban. The ban on international flights servicing airports in the Kurdish region is set to go into effect. "We didn't understand what it meant," Saleh said of the demand. "An airport isn't an item that can be handed over to someone." Saleh said authorities in Baghdad did not respond to requests for clarification. She condemned the ban, accusing the central government of "just punishing their own people." Military, humanitarian and diplomatic flights will continue from the airport uninterrupted according to the information relayed from Baghdad, Saleh added. Hundreds of passengers are filing through Irbil international airport in the hours ahead of a flight ban threatened by Baghdad following a controversial Kurdish independence referendum held this week. Airport officials speaking on condition of anonymity say the volume of passengers is higher than usual but no additional flights were added to accommodate people attempting to depart the region. The ban was scheduled to kick in Friday evening. Many of the hundreds of people traveling Friday afternoon were foreigners ordered to leave the region by the companies they work for. Joao Gabriel Villar, a Brazilian doctor working for a non-governmental organization that helps people displaced by the conflict with the Islamic State group, says: "Of course we don't want to leave." Iraq's top Shiite cleric has expressed opposition to the vote in an independence referendum held this week in Iraq's Kurdish region and disputed territories. Grand Ayatollah Ali al-Sistani says it "is an attempt to divide Iraq and take its northern part by setting up an independent state." Al-Sistani's comments were the first by the top Shiite cleric since Monday's referendum. In a statement read in the Shiite holy city of Karbala by cleric Ahmad al-Safi during Friday prayers, al-Sistani said all parties in Iraq should abide by the Iraqi constitution. Al-Sistani warned that such "unilateral steps" toward dividing Iraq will lead to internal and external reactions that will have consequences on our "dear Kurdish citizens and could have more dangerous repercussion." He called on Kurdish officials to return to the constitution. An Iraqi government order that international airlines halt all flights in and out of the cities of Irbil and Sulaimaniyah will kick in Friday evening local time. The move is due to tensions over an independence referendum held this week in Iraq's Kurdish region and disputed territories. Iraq's Transport Ministry ordered international airlines to halt service to Irbil, the Kurdish regional capital, and Sulaimaniyah, its second city. Regional airlines have said they will honor the flight ban. The nonbinding referendum — in which the Kurds voted overwhelmingly in favor of independence from Iraq — was billed by Kurdish leaders as an exercise in self-determination. The idea of an independent state has been central to Kurdish politics for decades.